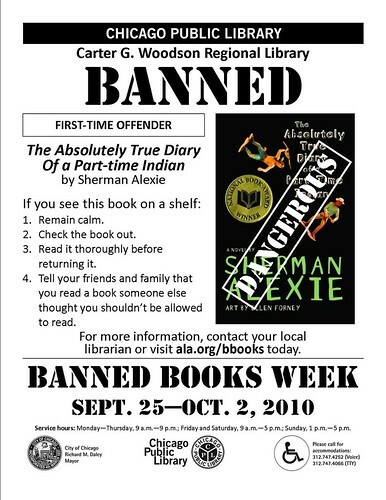 In this tail end of Banned Books Week 2011, I thought it appropriate to write a love-filled shout-out to Sherman Alexie’s The Absolutely True Diary of a Part-Time Indian. For those who haven’t yet read this book, I hope you do. The narrative centers on a young 14-year-old boy named Arnold Spirit. He is a Spokane Indian living in Wellpinit, Washington. The book is rich, filled with various issues ranging from (what can be called) typical adolescent angst about growing up and fitting in to darker, more difficult discussions about poverty, bullying, alcoholism, prejudice, racial and ethnic inequalities, and death. Arnold is a fighter. And fighting–persistence, perseverance in the face of great adversity, and, yes, physical fistfights–is a major theme of the book. Fighting, if we really think about it, sometimes calls for hyperawareness and vigilance. A very wise person I greatly admire once said that fighting, while important, carries a price. Fighters can get isolated and dismissed. They get tired. Fighting is incredibly hard and, lots of times, very lonely. The cause may be great and the fight important, but at what expense? When does one stop being a fighter and start being a jerk? To continue fighting the good fight, fighters need friends. Buffy had Willow. Arnold had Gordy. Every fighter needs all the support he can get. And not just one. Many. Repeatedly. That’s where books come in. Sherman Alexie wrote that many readers read novels in order to save themselves. Words, stories, and ideas can help equip readers to continue fighting their own battles. Books like Alexie’s show readers that it’s possible to arm oneself with words and ideas. They also help readers see that there are others out there who are ready and willing to listen. ← Hello world!, Or it lives!